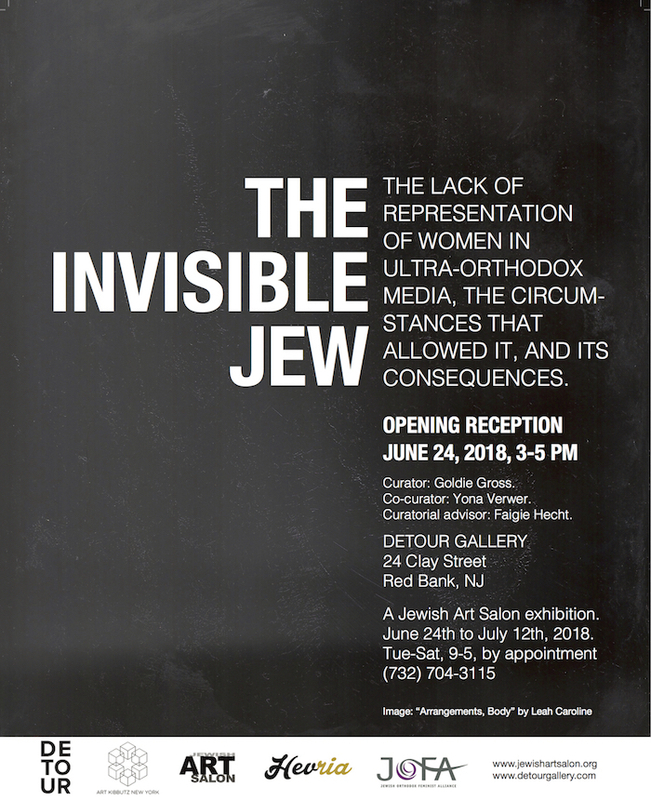 Detour Gallery and the Jewish Art Salon present THE INVISIBLE JEW: the lack of representation of women in orthodox media, the circumstances that allowed it, its consequences, and related issues. This exhibition deals with the systematic bias that has created the invisible women of Orthodox Judaism. 38 Artists from the US, Europe and Israel are expressing their insight on this subject in a powerful, persuasive show, that will help bring female imagery to the front lines of Orthodox Judaism. The exhibition addresses seven related themes: ERASURE, THE WOMEN’S SECTION / SEPARATION, EMPOWERMENT, MIKVEH / IMPURITY, PURITY, IDENTITY and INEQUALITY. View themes and photos here. Lately, along with the rise of the #MeToo movement, there have been several news items about the disadvantages of being a woman in Orthodox Judaism. In this branch of Judaism, particularly within Ultra-Orthodoxy, women are often told by the patriarchy how to dress, act, and be. Women are told that they are “separate but equal,” and are admonished for damaging the integrity of their community if they do not follow strict rules of modesty. In addition many ultra-Orthodox publications tend to systematically exclude not only Jewish women: Ultra-Orthodox newspaper Yated Ne’eman refused to publish a picture of Hillary Clinton when discussing her political campaign. They opted to replace her image with one of her husband. Hevria, a creative Jewish blog, published an article titled “The Invisible Jew.” Written by Merri Ukraincik, the article details her despair at finding that her friend, honored by a gala along with her husband, was left off the invitation. Only her husband’s photograph was shown. Orthodox Instagram personality Adina Miles tried to fight this epidemic with humor, publishing an advertisement with her face covered with an emoji. Published successfully, she faced major backlash from her community, receiving personal insults and threats against her children. As Avital Chizhik-Goldschmidt writes for the Forward, “female presence seems to be disappearing from the Orthodox public space.” Orthodox Instagram personality Adina Miles tried to fight this epidemic with humor, publishing an advertisement with her face covered with an emoji. Published successfully, she faced major backlash from her community, receiving personal insults and threats against her children. Unfortunately, many ultra-Orthodox publications tend to systematically exclude not only Jewish women: Ultra-Orthodox newspaper Yated Ne’eman refused to publish a picture of Hillary Clinton when discussing her political campaign. They opted to replace her image with one of her husband. This bias is tolerated and put up with by most women in their communities. “This is just the way it is,” is what is told to children. Not “let’s make a change,” not “let’s do better.” Only “what can you do?” and a shrug. This exhibition aims to raise awareness and question this issue through art. Similar to the #MeToo movement, it is our hope that sunlight will be the best disinfectant. We hope that as the issue gains publicity, there will be a greater sense of collective responsibility to proactively change the Orthodox community’s inborn mechanisms. Exhibited art works will primarily be by women with a relationship to this matter, addressing what it feels like to be an “Invisible Jew”, and to question how we can do better for the next generation of Jewish women. View these themes, images, and short statements here. During the opening a 12 minute dance performance will take place, HOLY/OBJECT, choreographed by Florence Nasar. The piece explores the concept of prayer spaces, mehitza, and woman as the holy/object. Ten dancers move through the questions, looking at the ways in which women’s voices, bodies, and presence are affected by ritualized silence, through both external and internalized boundaries. Andi Arnovitz, Daniel Baerwald, Rena Bannett, Gabriella Boros, Joanna Dion Brown, Isaac Brynjegard-Bialik, Leah Caroline, Fortune Chalme, Irina Chtypel, Lenore Mizrachi-Cohen, Shosh Cohen, Ronit Levin Delgado, Dorit Jordan Dotan, Sara Erenthal, Goldie Gross, Marcia Bricker Halperin, Oren Herschander, Alison Horvitz, Yehudis Keller, Ann Koffsky, Tali Margolin, Nechama Markowitz, Florence Nasar, Hadar Oppenheim, Joyce Polance, Leah Raab, Anna Roberts, Joan Roth, Cynthia Beth Rubin, Ruth Schreiber, Joel Silverstein, Miriam Stern, Yona Verwer, Jeane Vogel, Joyce Ellen Weinstein, Nurit Jacobs Yinon, Sarah Zell Young, and Billha Zussman. Curator: Goldie Gross is a Brooklyn-based artist and co-producer of the Jewish Art Salon’s exhibition “Jerusalem Between Heaven And Earth” at the Jerusalem Biennale 2017, curated by Ori Z. Soltes. For the Jewish Art Salon she is curated The Invisible Jew and Natural Instincts, and co-curated POW!!! Jewish Comic Art and Influence. She also curated Sukkahwood at Inwood Park, NYC. Co-curator: Yona Verwer, artist and founder / director of the Jewish Art Salon. Curatorial advisor: Faigie Roth, art historian. The Invisible Jew is hosted by Detour Gallery, and co-sponsored by JOFA, the Jewish Orthodox Feminist Alliance, Art Kibbutz, and Hevria. Image on poster: “Arrangements, Body” by Leah Caroline. We are a member organization and the exhibit consists primarily of works by our artist members. We had a call for art for this exhibit that closed quite a while ago, and all the works have been selected.